With the national average being one in three people having high blood pressure, or hypertension, the market for blood pressure monitors and accessories is growing. Doctors recommend tracking your BP if you are hypertensive outpatient or follow antihypertensive therapy. That is not always easy to do if you cannot get to the doctor’s office for medical checks, to the store for a check on their BP machine, or have your own blood pressure cuff at home. Manufactures have been trying to make this process more convenient by making digital graph equipped HBP devices (for systolic and diastolic BP readings) you can have in your home. 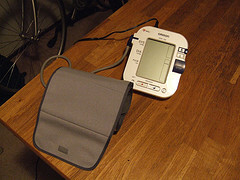 Much like any other product, however, you need to do some research to find the best blood pressure monitor available. There are some brands and models that will do the job fine for a while, but may not be as reliable or accurate as other models. Doing some online research before going to the store to look at and possibly test models of blood pressure upper arm cuffs could provide some valuable information. There are various brands, makes and models of blood pressure cuffs equipped with a graphic display. For instance, new Omron blood pressure cuffs come in various models that offer different types of additional information (like heartbeats monitor). There are the traditional type cuffs that go up on the arm, and then there are others that go around the wrist. You can talk to your doctor about which BP monitor is recommended for your use. It is important to get a cuff that will fit well around the circumference of the arm or wrist to be able to get an accurate measurement in mm Hg. Many health care stores have sample units available for demonstrations which help when making this type of decision. If you go with top rated Omron brand series 10, some of the features that may be of interest and help are a two person user model. This allows two hypertensive people to use the same blood pressure cuff and it will store their readings separately from one another. This is one of the best blood pressure monitor features. Some other models even have the ability to report through your computer the readings, so they can then be sent to the doctor’s office. Many models will track your heart rate and give a warning if the rate is too high or too low. The same can be done for an irregular heartbeat being detected. Some models (mostly Omron and Panasonic) will offer more features than others, so be sure to read the products information on each type. The same with the wrist models of the blood pressure cuff. There are only a few automatic models of this, but each has its own functions. Your doctor may ask you to take a reading every day at the same time, or maybe even multiple times a day. If this is the case, having a blood pressure cuff at home will be the most convenient way to go. The doctor can even help you calibrate your home BP machine for free to make sure it is producing accurate readings in mmHg. Many doctors do recommend the Omron blood pressure cuff as the best blood pressure monitor available on the market.